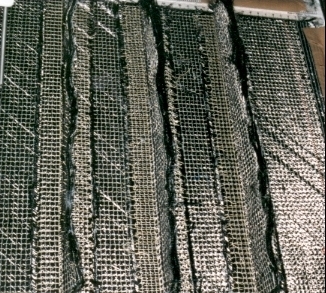 Ellis Developments have developed a number of techniques for through stitching composites to reduce delamination. This includes both dry fibre lay-ups and prepreg. We believe that we are the only company capable of through stitching pre-impregnated fabrics, and particularly have demonstrated corner reinforcement, corners being particularly susceptible to delamination. Products normally show considerably improved impact resistance. 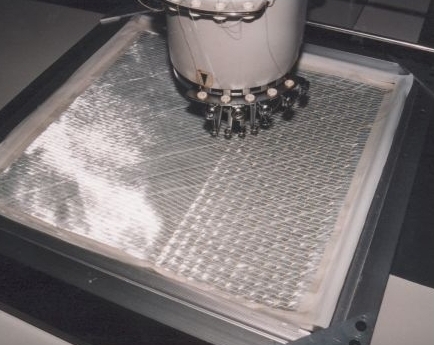 Through stitching can be done on fairly large areas of flat dry reinforcement quite quickly and easily using conventional embroidery machinery, but pre-impregnated fabrics (pre-pregs) are more difficult, and need our special techniques developed in-house. We can through stitch with polyester, glass, aramid and PBO, and are examining other fibres. Carbon is currently very difficult, because it is so stiff and is currently only available in relatively large thicknesses unsuitable for sewing. We will be pleased to look at your particular problem, we may well be able to help. Do contact us to begin a discussion.